I believe every Malaysian will tell you this, especially the ones who are staying in major cities area, especially Kuala Lumpur and Penang. A typical working adult with average income can only afford to buy small apartment around 600-900 square feet. Sounds sad but it’s true due to increasing demand around Klang Valley. 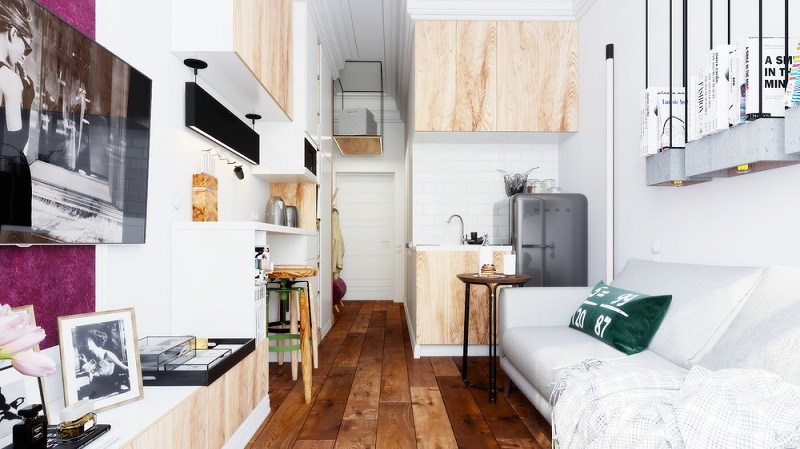 So with limited resources in hand, you would want to bring out the best of your small, little apartment and be able to call it home. This is where the power of home decorating comes in. With just 10 unique tips, we can grant your wish by transforming your small apartment into a modern and stylish bungalow. Mirrors are great for optical illusion. If you have a small room with limited space, you can install a few strategic placed mirrors so that your room looks bigger and spacious. Mirrors also bring light and depth into a room. They serve as decorative windows which you can move around and place them according to your lifestyle. One of the important element in making your room larger is to have proper lighting. Place lamps in all corners of your small apartment so that every space is decorated with pools of light. If floor and table lamps are taking too much space, you can install wall-mounted lamps or lighting panel on your suspended ceiling for illumination purpose. Before you start buying furniture, you will need to decide which single piece of furniture is necessity for each room. For instance, bed is important for a bedroom while sofa is essential for a living room. After bringing in your necessary furniture, you can add in the rest of your decorative items to bring more color and texture to your room. It’s important not to squished your furniture all against the wall as this makes the room looks uninviting and lack of warmth. Keep your furniture out of traffic’s way as you wouldn’t want to bang a coffee table on your way to the kitchen. Lastly, avoid blocking your doors, windows and hallways with your furniture. When you have limited space on the floor, it’s best to start being creative with the space on top of you. Create partitions above you with professional help and fingers snap*… you will have another room for your disposal. You can convert these unused space into your private library, storage or even a small bedroom. One of greatest headache that small apartment owners have is lack of space. This is where built-in cabinets and shelves come into the picture. With these additional wall space, they can finally keep their things tidy and neat with minimal effort. Choosing the right colour is essential in make your small apartment look bigger. In this case, white colour is the best option to decorate your walls so that it look bright and airy. Bright colours are usually reflective whereby they can maximize illumination effect on all corners of your home. Instead of just buying a furniture for one purpose, it’s best to explore a furniture with multiple purpose. For instance, your kitchen island can be your dining table, hidden storage, decorative art etc. Having multiple purpose furniture could actually save more room space, and most importantly save more money. Common myth of home decorating is getting the biggest and cheapest furniture in the market. This works fine if you have a big apartment, but not a typical small apartment. Bulky furniture would actually eat up plenty of room space causing your home look uninviting and untidy. The best solution for this is actually plan and choose the right size of furniture for your overall home decorating. However please bear in mind that compensate in size doesn’t mean that you are losing in term of quality. You can still get optimum scale of furniture with the best quality in town. Ever wonder how does it feel to become a magician? You can actually be a home decoration magician, whereby you can hide away your furniture and rooms in plain sight. The trick is utilizing hidden storage around your house to virtually create more room space. You can hide away your toilet into the wall or create hidden storage under your bed or sofa. Let your creative ideas run wild and you will be surprise with the outcome. Finally, the most important tip in decorating your small apartment is planning according to your style. Many people would want to decorate their room according to magazines or pictures around the web. But the question is, are those designs actually compatible with their daily lives? For instance, I’m impressed with all the beautiful small apartment decoration out there but it doesn’t suit me. I’m a minimalist person and I love to keep my house simple and neat. Take your time to plan property which kind of decoration suits you, rather than just copy blindly whatever is in the catalog. Think wisely and you will be soon on your way to discover what works for your apartment and what doesn’t.